The Paragon SFRC1 reduces bad odor and chorline and restores the softness back into your skin and hair. It also reduces hydrogen sulfate as well as calcium and soap film build up, making it easier to clean and keep your shower looking crystal clear. Filter lasts up to 10,000 gallons of water, depending on how much it is used. With a reduction in chlorine up to 99% and hydrogen sulfate, this filter puts that silky soft feeling back to your hair, scalp and skin. Using this filter you will also have the added bonus of not having to use so much soap, shampoo and conditioner in your daily wash.
- Reduces hydrogen sulfate and restores natural softness of hair, skin and scalp. - Eliminates water odor and chlorine taste. 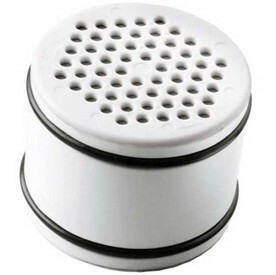 Works with Rain Shower head filter AUSUN ( PRS1, SUN100 ). Media is NSF certified for Free Available Chlorine Reduction.